Welcome to Week 20 of the One Yard Wonders Sew Along! Cindy selected Amy Butler Soul Blossoms Home Decor Peacock Feathers Turquoise. 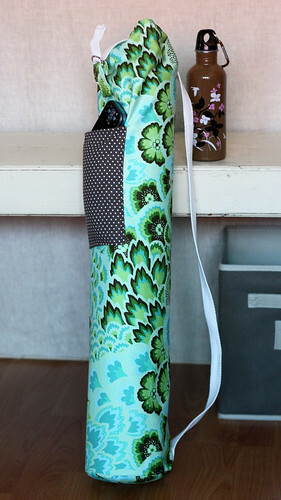 The Home Decor fabric was a great choice for a Yoga Bag. Cindy created the pocket with fabric from her stash. 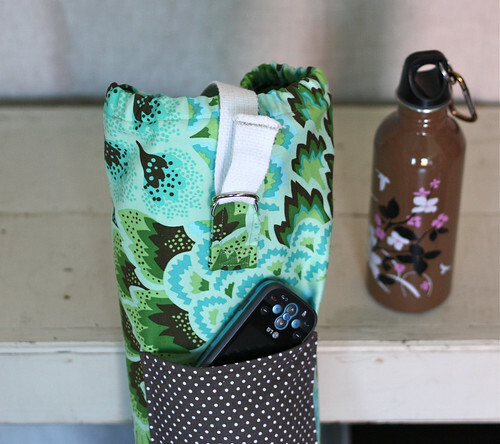 The pocket is handy for keys or a cell phone. Cindy found clipping the bag exterior & lining extensively before pinning the circle to it worked well. She drew a line 1/2 inch from the raw edge of the bag body and clipped to it. This simplified easing in the quantity of fabric. 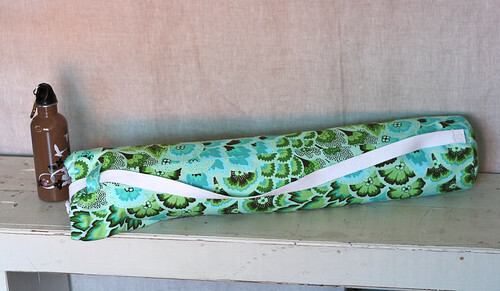 The pattern called for 22″ of elastic. Cindy shortened it to 13″ for the 16″ casing. The opening was still generous, next time she would consider using a drawstring. The directions add the elastic before sewing on the strap loop and D-ring tab. Cindy sewed the loop and D-ring on first. She didn’t think there would be room to get it under her machine if the elastic was already sewn in. This worked well. Cindy is ready for Yoga class! Janis chose to use two fabrics. 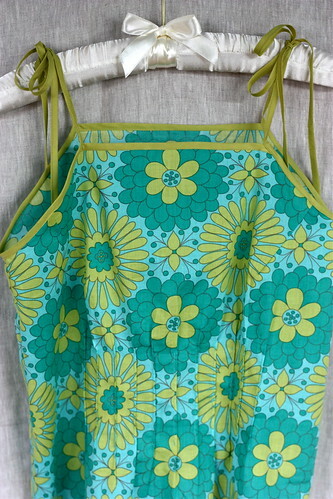 Timeless Treasures Darling Clementine Cotton Lawn Set Medallions Aqua for the body. 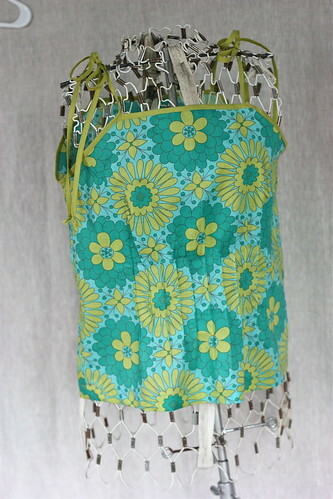 For the piping Free Spirit Voile Solids Kiwi. This pattern went together easily! The instructions were simple to follow as they were written. 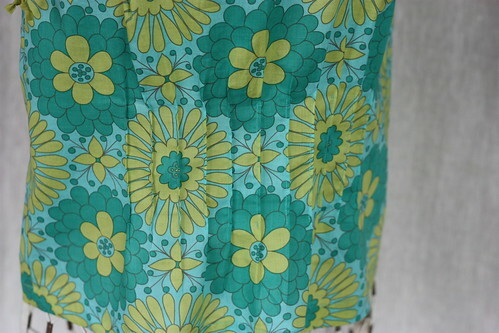 Janis decided to use cotton lawn as this pattern looked like it would lay better with the softer fabric. It was the perfect choice. Easy to work with, and it flows beautifully. One yard was more than enough for the X-Small and Small sizes. Only 19 inches were used for the small. She used the method that Alicia used to cut out her bag. (One Yard Wonders week 19) Fold the fabric over lengthwise to match the width of the pattern in the size needed, cut out the front and back at the same time(this only works on the smaller sizes). One inch bias tape was made from the solid green voile so that it would remain as floaty as the main fabric. Use a 12 mm bias tape maker.